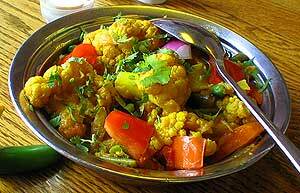 Bhindi masala is the most famous dish of Northern India. The base is prepared with garam masala, vine ripened tomatoes, Indian spices, and then the sliced onions are added and stir fried adding fresh okra and cooking them till the oil separates. Assorted vegetables(blue lake beans, cauliflower, carrots, white creamer, bell peppers, mushrooms, and cut corns)are cooked in a gravy of red onions, ginger, garlic and vine ripened tomatoes in a iron wok. 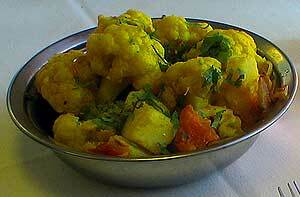 Fresh cauliflowers and white potatoes cooked in Kashmiri style with fresh mint leave herbs and spices. Clay Oven baked jumbo eggplants cooked with red onions, ginger, garlic and vine ripened tomatoes with fresh peas. Eggplants cooked with red onions, ginger, garlic and vine ripened tomatoes with white potatoes. 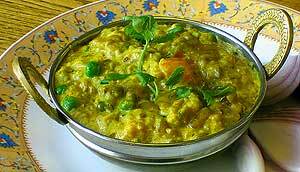 White potatoes cooked with green peas, royal cumin, ginger, garlic, and tomatoes. Fresh mushrooms cooked with green peas in a vessel. Home made cottage cheese cubes cooked with fresh spinach leaves with a little yogurt, ginger, garlic, and tomatoes. 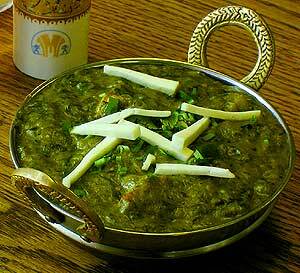 White potatoes cooked with fresh spinach leaves in a thick spinach puree. 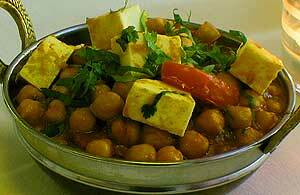 Home made cottage cheese cubes cooked in a smooth nutty curry with a touch of saffron with base gravy of onions, ginger, garlic, and wine ripened tomatoes with Indian spices and low fat butter. 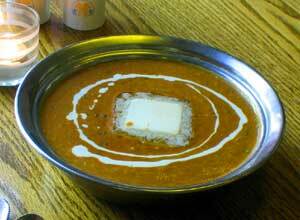 Home made cottage cheese cubes cooked in a smooth nutty curry with saffron in base gravy of onions, ginger, garlic and vine ripened tomatoes with spices and low fat cream. Black beans, chickpea, and kidney beans boiled together in water and cooked in the base gravy of low fat cream, butter, ginger, garlic and vine ripened tomatoes. Assortment of fresh vegetables mashed together and mixed with home made cottage cheese formed in cylindrical shape dumplings cooked in the base gravy of saffron, cashews, ginger, garlic, tomatoes, and garam masala. Garbanzo beans and fresh home made cottage cheese cubes cooked together in a curry of pomegranate, royal cumin, black pepper and a blend of spiced powder and slices of ginger, garlic, red onions, and jalapeno. Assorted vegetables cooked together into a stew dish with coconut milk, butter milk, mustard seeds, and water as it is cooked in a southindian style.